Posted on October 17, 2015 October 17, 2015 by Yenn	Bookmark the permalink. Also: Kids who have been invalidated or disbelieved repeatedly on the issue of bullying will learn to not tell. That’s what happened to me – I got punished for telling the truth that eventually I just decided that they must think I deserve that treatment and quit telling them. Thanks for sharing this. As someone who is going through horrific cyberbullying right now, it’s so important to get this message out. Sadly, the bully making my life hell herself pretends to be the victim of the many people she is victimising and there is nothing any of us can do about it. 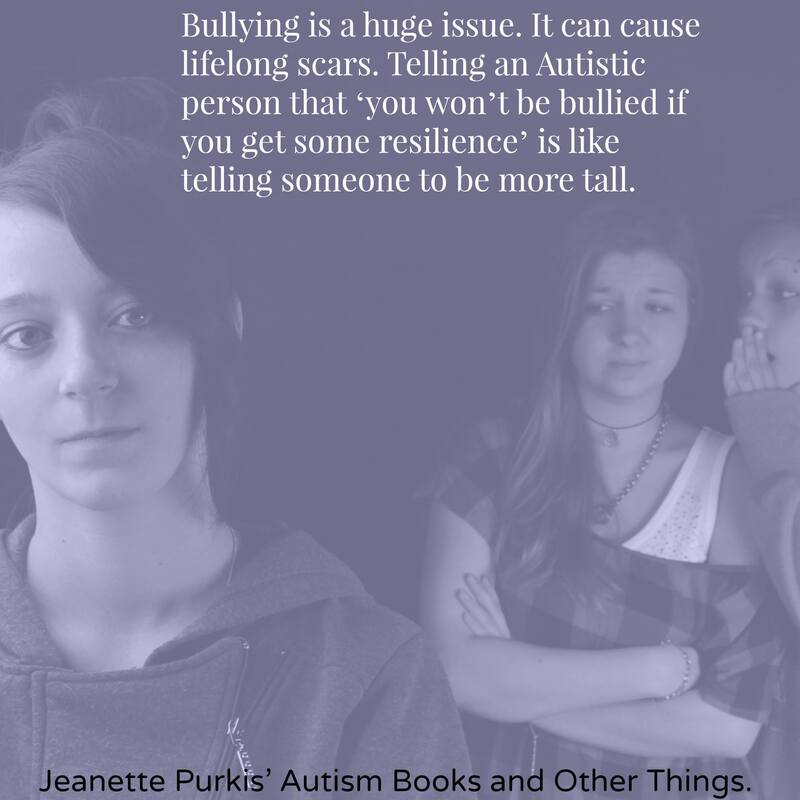 At least, even though I agree with you that people with ASC can be bullies (having autism doesn’t make a person good or bad), I have found that, in general, there is a lot more acceptance and a lot less bullying amongst auties and aspies than in the general population so our “autie community” is one of the places I feel most safest to be around. I wish I could say the same for the autism parent community. Sadly I find there is one of the places I feel least safest as an aspie myself. It seems there is a lot of bullying of aspies by aspie parents. I’m sure most aren’t even aware how cruel some of their comments are towards those with autism, that they are just venting their frustration at having a child that is “different”, but even accidental bullying is still bullying and what I love about your blog, Jeanette, is how it shows that us auties and aspies are human too. I read the article. I disagree with your friend. The article actually is very very bad. It is the kind of bad that has insidious tentacles of sneeringly bright and breezy yet cackling brittle tonalities embedded deep inside its tapestry. That is what made me feel utterly sick to my core, and its echoing mockery still resonates in my mind, weeks after I first read that article. The worst kind of bullying is the kind that is sanctioned, protected, and delivered with a veneer of righteousness and high morality. This is it. Yes, people (NT and ASC) are, as a result flinging mud and whatnot around, but look at the core of the situation and you will find some rather disturbing answers. A deepset conundrum that cannot easily be resolved in the short term. My own verbality has been arrested as a result of my brain’s ability to perceive the multidimensional aspects of this one explosion, at the root of which lies manifold layers of hurt, pain, anguish and yes, anger vs. institutionalised denial of Being at best, and torture at worst. The brain and soul computes and reacts to abuse in different ways, and abuse comes in myriad forms too. It is a complex issue. The offensive article glossed over all that to preach a positive-thinking view, and this not by a lay person offering limited perspectives but by a self-styped expert in autism therapies. That alone strikes a very different timbre, with sombre sonic repercussions. The article goes out to an audience – NT and ASC and neurodiverse – who may sadly employ the “come on, pull up your socks” attitude towards a child/teen/adult crying out for help. Not good. Instead of addressing the issue with depth of empathy, that article delivered a witch-doctor’s potion. I do not condone cyberbullying of any kind. However, an outcry of such monumental proportions ought to be taken seriously. I have read many eloquent pieces by autistic advocates against this offensive article. None of them come across to me as cyberbullying. Perhaps some comments from the lay-persons (ASC & NTs) may have been retaliatory bullying, I do not know for certain as it was far too triggering for me to read all comments. But personally, I was and still am tormented by that article, it has dredged out so much pain that I have been unable to articulate my reaction directly. The ADN and the author of that offensive piece have stolidly stood by it, and assert that all of the pain it triggered is somewhat overreactive. That in itself is a form of gaslighting, the abuser making a mockery of the screaming victim. No, there is nothing innocent about this, whether originally intentional or not, it has now escalated into stone walling and yes, to me, this is a form of conscious abuse.